Fits 1960-63 Galaxie / full-size Ford. 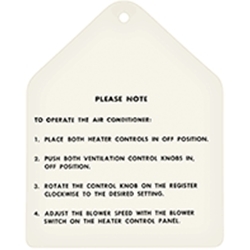 This A/C operating instructions tag hangs from any of the A/C control knobs. This is a high quality reproduction not genuine Ford.